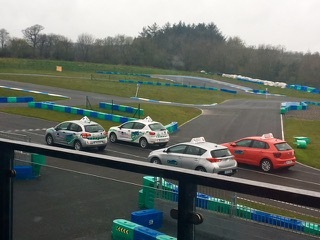 On Monday and Tuesday, the 23 and 24 April, TY's participated in a day-long Road Safety and Driving Course at Whiteriver Park Circuit, Co. Louth. 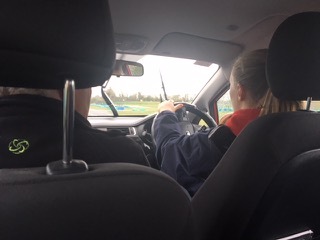 The most exciting part of the day was of course, getting to drive a car around the track, because for most of us, it was our first time behind the wheel. We took turns driving dual-control cars under the supervision of a driving instructor. While we were all very slow at the beginning, in fear of crashing our cars and making an absolute fool out of ourselves in front of our friends, who were passengers in the backseats, we eventually got the hang of it, and after half an hour or so, all of the cars were flying around the track no problem! Which also learned how to reverse park, which was quite tricky. Overall, it was a really fun day, and I think we'll all be a lot more prepared for what to expect when we do go for our first driving lessons. The day also reinforced what we learned throughout the year about road safety, and hopefully now, after experiencing what it's actually like to be a car driver, we'll better understand the importance of the rules of the road. 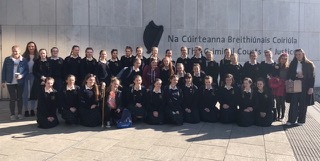 On the 21 April, the full Loreto Balbriggan Mock Trials team headed down to the Criminal Courts of Justice, transforming for a day into barristers, solicitors, witnesses, jury members and others. We had been preparing for the cases, the DPP v. Francis Cara and the DPP v. Pat Plaice, for about two weeks. Both were criminal cases: one was about an alleged burglary, and the other an alleged arson attack in the form of a petrol bombing. 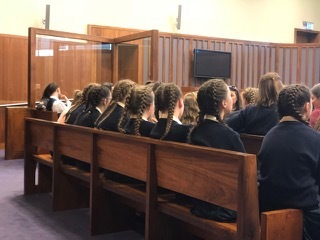 We were all very excited and nervous entering courtroom 13, where the three trials were due to take place: we were acting as prosecution and defence for the Pat Plaice case, and as defence for the Francis Cara case. Our barristers were Emily O'Sullivan, Zoefia Woods, Ailís Odell and Ailbhe Rogers, and working alongside them were solicitors Megan Carroll, Ciara O'Reilly and Alessandra Griusario. 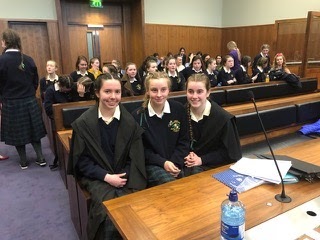 We also had brilliant court registrars, tipstaffs and timekeepers, Ruby Pereira, Aoife Kenney and Alannah Ward who ensured that the rules of court were upheld. Also working in the courtroom on the day were court reporter, Orlagh Herne, photographer, Milana Vilenskya and sketch artist, Lauryn Flynn. Each case was presided over by a judge, and while a jury (made up of students from other schools) was present to decide on a verdict, it was the judge who scored the contestants and who decided on the real winner of each trial. There were stunning performances from all of our witnesses, whose quick thinking and talented acting helped them to outmanouver the opposing barristers who were cross-examining them, and in the case of Aoibha Mulhall (as the shopkeeper Gabby Codd), the other barrister struggled to even get a word in, as she rambled on and on! Maeve Curnyn acted as Pat Plaice, the accused: a former burglarer determined not to return to the dark place of her past, Mount "Sadness", and who was simply a diabetic whose insulin monitor had run out of batteries, which she needed straight away. Emma Dolan acted as Billy Boyce, an eccentric physics professor who smokes a pipe, and uses a walking stick, and who was wrting his thesis on molecular physics and the effects of dark matter on the growth of mushrooms (a special thanks to Mr Higgins for his tie!). Ailís played Garda O'Reilly, while the gun-owning, but terrified-out-of-her-life shopkeeper, Gabby Codd, was played by Aoibha Mulhall. The dear, charming Majorie Magoo, a just-turned-60-year-old off-licence worker, was played by Clíodhna Bowers, who was "on it like a car bonnet!" Finally dressed all in pink, was the Legally Blonde styled Dearbhla Flynn, acting as the young Francis Cara, who owned the nail salon, 'Fingertips by Fran'. Unfortunately, the judge refused to let her take her pink handbag and Bruiser the chihuahua up with her to the witness stand. We won all three of our cases! There were tears and hugs at every victory of the day, and to top it all off, it was announced at the end that we had won 2nd overall, out of around forty schools nationwide! Everyone was absolutely thrilled, knowing that we had gotten through to the second round of the competition, the semi-finals. It couldn't have been done of course without the hours of hard work and preparation we had put into the Mock Trials, including the efforts of the research team and the costume department, as well of course as the time and effort put in by Mr Daly and Ms O'Neill, and all the teachers who had to put up with us missing class for over a week! The work however, is not yet even nearly finished. Best of luck to all the girls who will be taking part in Round 2 of the Mock Trials competition, the semi-finals, on May 12th! Keep up the hard work! We had classes as normal in the morning, had break then we headed down to the all - weather pitch and the PE teachers told us to stretch in order to avoid tension while jogging/running. The first group that ran were those who were more likely to run constantly throughout the run and the rest of us ran at a normal pace. We ran past SuperValu, to St. Peter's and Paul's and towards Millfield Shopping Center where we completed 1K. We kept running towards St. George's Nation School and towards the M1. Then from there we completed 2K. We ran down towards Arro and down the path making our way towards the AIB bank. 500ml bottles of water provided there where we completed 5K. Then we walked at a normal pace towards the school where we were served refreshments, took photos and enjoyed our time listening to music. We were awarded a double lunch for our great participation skills.